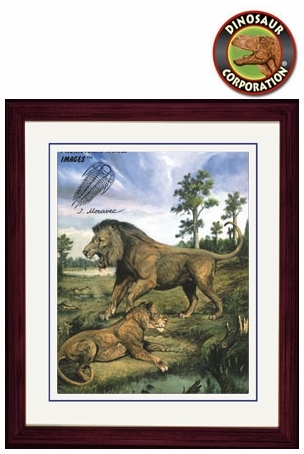 Home | DINOSAUR PAINTINGS | American Lion Panthera Leo Atrox | Panthera leo atrox - Framed Picture 17" x 14"
America Lion, Panthera leo atrox is framed in solid wood frame 17" x 14", double matted. This extinct lion was found in throughout North America as well as northern South America. It had sharp retractable claws and sharp teeth (shorter than those of other extinct cats). The most well known fossils found were out of the Rancho La Brea tar pits in Los Angeles, although some were also found in Alaska. Other subspecies of the American leo can be found today in parts of Africa and in western India. ▪ Panthera leo atrox, 13" x 19"